In the early 1950s, the east side of Long Beach was growing very fast. New single-family homes were built by the hundreds, which resulted in thousands of new residents in that part of Long Beach. The California-Arizona Conference (now the California-Pacific Conference) recognized a need to establish a Methodist Church in the area. Bishop Gerald Kennedy assigned Dr. Ray Firth to the Los Altos area to establish a new congregation in 1954. Dr. Firth arranged an initial organizational meeting at Lakewood Community Church. About twenty-five people attended the meeting and the group voted to find a temporary meeting place for worship. The congregation was able to rent the Stanford Junior High School auditorium for worship and the cafeteria for Sunday school. The membership of the church grew quickly from 97 Founding Members in 1954 to 277 members in 1956 with 233 children enrolled in the Sunday school program. The Conference acquired the land at the corner of Willow Street and Woodruff Avenue. The chapel and an education wing were completed and consecrated by Bishop Kennedy in 1956. The lounge building was completed in 1957 and three years later the administrative office building was built. The membership soon grew to almost 1,400 and plans were launched for building the sanctuary. 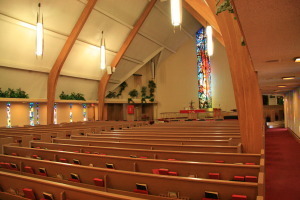 The sanctuary was consecrated in 1965, just eleven years after Dr. Firth was assigned to organize the congregation. In 1987, the congregation celebrated the final payment of the mortgage. Los Altos members have been in mission since early in the church's history. Some projects were short-lived, such as the Service Counseling Center established at the church during the Vietnam War. Others are ongoing, or had a longer lifespan such as Alternative Christmas, Meals for Millions, Habitat for Humanity, Ecology Fair, the Door of Faith Orphanage in Mexico, and the CROP Walk. Other projects include feeding the homeless in downtown Long Beach, Get on the Bus, health fairs for the community, participation in Interfaith Council of Long Beach’s ecumenical projects, a food pantry at the church, support for Centro Shalom and Christian Outreach in Action (COA) as well as Conference and international outreach such as United Methodist Commission on Relief. When the original electronic organ no longer functioned, the church purchased the historic tracker pipe organ. It was built in 1846, shipped around the Horn of South America, and originally installed in a Presbyterian Church in San Francisco. The organ is registered and listed in the Historical Record. For more information about the history of the organ and other instruments at Los Altos UMC. Los Altos United Methodist Church’s history has been rich and the congregation continues to minister to its constituents as well as serving as a mission outreach arm.